IBM has published a research report titled “Triage and capture: rethinking mobile email“. I’ve conducted an email interview with the lead researcher of the team, dr. Jeff Pierce about the findings of the project and the response by the test users. 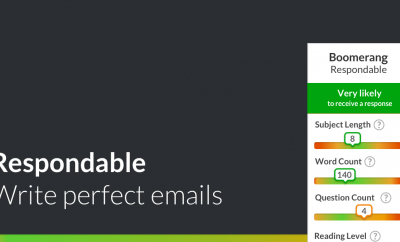 How was the reception of the new mobile email client with the triage options? Did they use it ‘naturally’ or need some practice? I’d say it was good, with a caveat. The mobile email client we built was a research prototype, which largely means that we built it to explore a point in the design space rather than intended that it be a production quality application. Just as a single example of what that means, we never built a mechanism to reply to email messages, since that wasn’t what we were focusing on learning (although I’ll note that none of the folks using the prototype ever asked for the ability to reply; take from that what you will ;). We did deploy the email application internally to a set of users to study the triage and capture aspects. Overall users liked both the ability to more easily identify what was new and important (and we’ve done more research in the vein of helping users identify “highlights” within their email) and the ability to capture tasks around messages. However, one issue we ran into was that the desktop email client was just a regular email client with a plugin to show captured tasks; users wanted better integration than that on the desktop side. So I think to be really successfully we would need to rebuild the desktop email client to better leverage email handling the user performed on the mobile client. But that was beyond the scope of the research project. 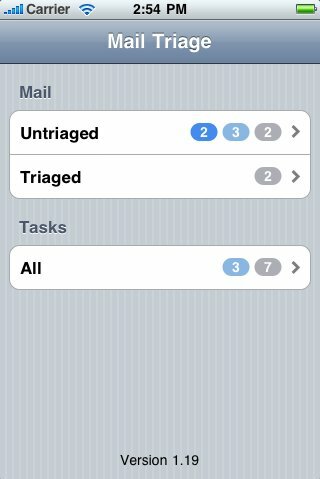 Instead of the inbox, the mail triage screen is shown. Will the mobile email client be proposed as an app in the App store / Market of resp. Apple iOS and Android, or will it be a clients-only app? 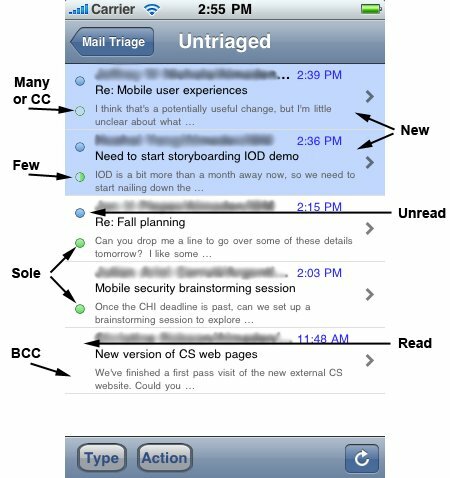 Has there already been shown interest for the mobile email client from IBM clients yet, or not? We have shown it to clients (we actually demoed it at Lotusphere 2010 in the Innovation Lab), and folks have shown interest. But we haven’t yet made it available for clients to try. Untriaged view of the inbox, with circles on the left indicating how many people were involved in the email conversation, including CC. What type of email user and daily volume would benefit most of this triage-style of email handling? Someone on a project group, a support group or different? On daily volume: 5 would be low, 20 would be medium and 50+ would be high volume. I’d say medium volumes and up. If you’re only getting 5 messages a day, you don’t need help keeping track of tasks you need to handle in your email. But as soon as you have 15-20 messages or more in the morning, it starts to become useful to have help determining what’s new, what you’ve already decided how to handle, and what tasks you have associated with those messages. I’d argue that the more email you have the more helpful supporting triaging messages and capturing intended tasks becomes, because it gets progressively harder to keep track of what you have and haven’t handled as you get more and more messages. When using triage as email management, will other email users be trained to write better subject lines, so the person triaging can better judge the email by its subject line? I can imagine (and have experienced) subject lines like “Question” or “Help with this please” – will those be a thing of the past? Hmmm, possibly. Although we’ve done some separate studies of how much information preview to show for email messages, and people are surprisingly good at figuring out what a message is about just from the sender, subject, and a couple of lines of the body. 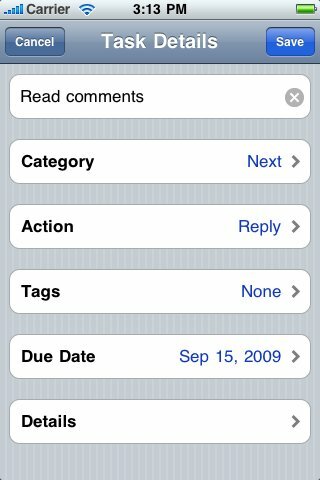 Tasks overview in the mobile email client. Has the new mobile email client with the triage options made email volume by the users involved drop, grow or stay the same? Giving folks new or different mechanisms to handle messages doesn’t really make the volume go up or down, although I could spin an argument where keeping track of the work associated with your tasks might result in fewer follow-up messages from your colleagues asking when you’re going to respond to their messages or accomplish some task they set for you. But we didn’t see any changes in incoming email volume that were attributable to our prototype client from those users trying it out. A video showing the way email triage works (c) IBM Research. I’d like to thank dr. Jeff Pierce for his time in answering these questions and giving these insights into the research study!